As Lower Coralline Limestone is a very hard rock, it is very difficult to erode. Because of these characteristics, it has its own set of landforms. In the areas where this type of rock is found, there is the production of vertical sheer cliffs. 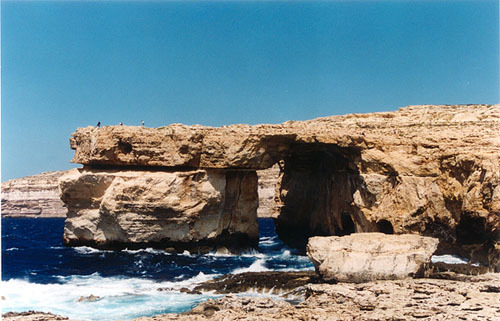 Examples are the cliffs in the Western side of the Maltese Islands like Ghar Lapsi and Dwejra. Vertical sheer cliffs form when there is a hard rock which cannot be eroded. In this way after that the soft rock in front is eroded, the hard rock is exposed. Then the wave action from the coastal area starts eating the cliff from beneath. First it forms a small notch. This notch continues to grow until the hard rock above it cannot stand and falls into the sea. This forms a sheer vertical cliff face. When this type of rock is found Inland, there is fault formation. These faults also turn into valley gorges like Wied Babu, Wied Dalam and Wied Incita which are Maltese examples. Like all other limestone rock, the Lower Coralline Limestone is associated with Limestone platform plateau and with Karst Landscape. Below: The Blue Grotto; another sea arc (Lower Coralline Limestone) this time found in Malta. Below: A photo of It-Tieqa, Dwejra, Gozo. It was formed by the erosion of Lower Coralline Limestone.